Art in all its forms of expression is a fundamental part of Monroe Street Market. Check out the great workspaces and resources available to residents—and cultivate the artist in you. See website for updated hours. See online calendar for events/exhibition openings. Sat: 9am-4pm or by apt. Part of Art on 8th, the Arts Walk teamed up with Dance Place and ArtSpace Lofts to offer DC’s artistic community an exciting place to create and exhibit their work. 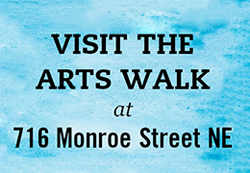 Visit the studios to shop—and join us for free music, dance, and more at Monroe Street Market. For more information on our artist work studios, see below. For more information on Dance Place, visit danceplace.org. For more information on ArtSpace Lofts, visit artspace.org/our-places/brookland-artspace-lofts. 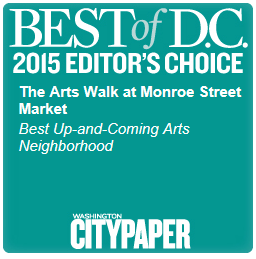 For artist studio inquiries, please contact Monroe Street Market. For leasing inquiries for Edgewood Arts please contact Elizabeth Zinni. Whether you want to draw, paint, print, sculpt, weave, or build, you’ll finally have the space to express your creativity and exhibit your work in one of the spacious, work studios at Brookland Works. Artists may contact Monroe Street Market for a work studio; proposals will be reviewed by a selection panel based on eligibility criteria.